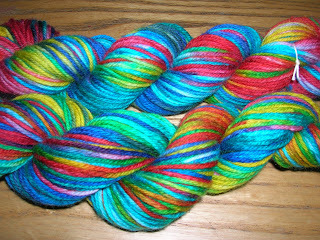 Come and learn how to use acid dyes (suitable for wool, silk and nylon/polyamide fibres) to handpaint yarn like the skeins above. Acid dyes are relatively low-impact environmentally (non-toxic and not wasteful on water) and also pretty economical... You'll have the opportunity to paint at least one skein of yarn, and go home with the instructions on how to do it again. The session will be at my house in Waterbeach, which is accessible hourly by both bus and train from central Cambridge and Ely (I'll send out times to people who sign up); there is also ample parking nearby. I can take a maximum of 6 people at a time for us to be comfortable. I will provide all equipment. The afternoon will cost £6 for dyestuffs, vinegar, use of equipment etc. if you bring your own pre-skeined yarn (or pre-washed fleece if you're a spinner); or £11 if you'd like me to provide you with a skein of Blue-Faced Leicester yarn in either superwash 4-ply suitable for socks (100g/350m) or laceweight (100g/1200m). Additional skeins of yarn will be available at £5 each but I'll need an idea of numbers before the day, as I have to order by the kilo. If you're interested, please e-mail me at liz [at] lizmarley [dot] co [dot] uk - you know what to replace there. Please don't reply with a comment on the blog because I can't see your e-mail address that way. If you like the idea but can't make that day, mail me anyway, because if more than 6 people reply I'll see if we can run another session. Yippee! (I've signed up already). 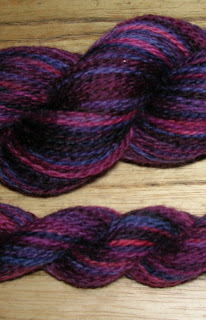 I also have lots of dyed roving. Count me in! Will that yarn I showed you on Saturday be OK? Deborah Smethers. Debs - please mail me at the address on the original post; as I said there, I have no way of getting in touch with you if you post here, and although Rosie's tried to find your e-mail among the hundreds on the list, we've not been able to identify it!